Kopivosian! It means Hello in Kadazan dialect; one of the major tribes which can be found in Sabah Borneo. Apart from that, there are also many other ethnic groups such as Dusun, Murut, Rungus, Bajau, Lundayeh, the list goes on! A tiny island which is located in the eastern part of Malaysia and shares the island of Borneo with Sarawak, Brunei, and Indonesian Kalimantan. Blessed with one of the oldest rainforests in the world, serene sandy beaches, and gazillion of natural treats that will grant anyone a feeling of paradise when visiting Sabah Borneo. Climbing Mount Kinabalu via Via Ferrata . Often we know that Sabah Borneo inspires plenty travelers from around the globe and is constantly rated as one of traveler’s top bucket list, which is to go for a climb at Mount Kinabalu. For most travelers, Mount Kinabalu is the only one that drives them to visit Sabah Borneo for holiday. With a high altitude of 4,096 meters, Mount Kinabalu is considered the highest peak in Malaysia. Climbing to reach the top is challenging and tough but once arriving at the peak, any travelers will feel proud of their achievements. However, there is a limited spot given to those who wish to climb Mount Kinabalu, travelers will need to arrange their trip in advance so to avoid any disappointment of not getting a slot. Apart from that, there are also some interesting jungle trails around Kinabalu National Park that can be alternative trekking activities. 2. Hiking trails & scenic attraction that no one can forget! In Sabah Borneo, there is no shortage of natural splendors that can be found, from lush tropical rainforest to the amazing jungle trails and scenic view from the top of the hill, making it a haven for hikers. Sabah Borneo is home to many natural sites such as Kinabalu National Park, Mount Trusmadi, Mount Tambuyukon, Batu Punggul, and Salt Trail Croker Range, which all of these places are perfect for avid trekkers to experience the challenging trails, as well as to see some unique Borneo flora and fauna along the trail. Moreover, there are also some places that are perfect for day hikes and travelers will not only lose some sweat for a day but also a chance to witness the amazing view from the top. Sabah Borneo is the best place for the nature enthusiast. Located on the island of Borneo, which is home to estimated 130 million years old of tropical rainforest, inhabited by 1600 known species of wildlife, birds, insects, and plants. It is not surprising that there are many travelers from around the world who are tempted to spend their Borneo Holidays in this unique forest paradise. Several jungle trails are available for travelers to venture in, such as Lupa Masa Jungle, Danum Valley, Maliau Basin, Kinabatangan River and Long Pasia. Apart from being immersed in the green nature of the tropical forest, travelers will get a unique chance to glimpse at some elusive Borneo wildlife species as they go through the jungle trails. Not only that, a few rare species of plants can also be found within the forest, such as Orchids, Pitcher Plant, Rafflesia, and more. Apart from being rich in tropical rainforest, Sabah Borneo also offers some of the best beach spots for those who are in need of “Vitamin Sea”. Not only that, some of the island beaches are gazetted by Sabah Borneo Government as a preserved marine national park, such as Tunku Abdul Rahman Park, Pulau Tiga Park, Turtle Islands Park, Tun Sakaran Marine Park, Sipadan Island Park, and Tun Mustapha Park. Beautiful turquoise waters, colorful coral reefs, and white sandy beaches, who can say “no” to that? Apart from that, there are also various water sports activities which can be done such as banana boat ride, parasailing, coral zip line, snorkeling, and more. In addition, travelers can also do island hopping, where they can get a chance to see more than one island in a day. With these exciting activities offered, spending holidays in these island beaches are always a good idea for a getaway! Sabah Borneo may have its jungle paradise, but it also has its paradise under the sea and it can be found at Sipadan Island! Known for being a top world class diving destination, Sipadan Island is home to thousands of turtles, schooling sharks, swirling barracuda, and awe-inspiring coral walls that are more than 600m straight down to the seafloor. Apart from being able to bring travelers a different side of the world, it also helps in getting rid everydays stress and pressure from the busy life. Discover the magnificent underwater marine life, as divers will get the chance to explore the hidden secrets and underwater treasures! Tantalizing food in Sabah Borneo! Aaahh…Talking about the food in Sabah Borneo, it is one of the reasons travelers miss the taste of it. Sabah Borneo is a melting pot of cultures ranging from the Kadazan, Dusun, Bajau, Murut, Rungus and more sub-ethnics, making the glorious and exotic cuisine of Sabah influenced by various ethnic communities. Interestingly, the many ethnic of Sabah Borneo are able to turn any wild plants from the jungle, herbs, and fruits into culinary delights. Apart from that, they too can create specialties from the abundance of fresh seafood and freshwater fish. Drooling already? Read our articles on the traditional food in Sabah Borneo and some of the must-eat food! With Sabah Borneo’s irresistible charms, the sandy beaches, exotic wildlife, greenery forests, and beautiful cultures, these are just some of the reasons that create its title of being a paradise. So, wait no more! Book your flight ticket now and go for a long-awaited trip to paradise in Sabah Borneo! Bring your family to Sandakan, Sabah for Borneo Holidays! When you are traveling with your family to Sabah Borneo, one of the destinations that you and your family should not miss out is Sandakan! It is located on the north-east coast part of Sabah Borneo, known to be the Nature City and a getaway to many wildlife destinations in Sabah Borneo. Sandakan is primarily famous for its Orangutan Rehabilitation Center which is located in Sepilok, about half an hour drive from Sandakan City area. In addition, Sandakan is also an important site for worlds’ history especially on the Sandakan Death Marches during the World War II. Moreover, Sandakan is also a foodie heaven, with its delectable food that you’ve never tasted before, making Sandakan a unique travel destination for your Borneo Holidays. There are a few modes of transportation that you can use to go Sandakan, such as by air or by an overland trip. You can go for a short domestic flight from Kuala Lumpur/ Kota Kinabalu to reach Sandakan. The flight from Kota Kinabalu to Sandakan will take you about 45 minutes, while from Kuala Lumpur to Sandakan is 2 hours and 45 minutes. If you choose not to fly, you can always go for an overland transfer for about 6-7 hours from Kota Kinabalu City to Sandakan. An overland transfer to Sandakan will grant you and your family a memorable experience, as it gives you an opportunity to check out some of Sabah Borneo’s great scenery from your window view. Upon arrival in Sandakan City, there are plenty of accommodations that are comfortable and budget that varies from high to low. You can bring your family to enjoy swimming at the pool which is overlooking the azure Sandakan Bay at the Four Points By Sheraton Sandakan, or to Sabah Hotel which is known to be one of the oldest hotel in Sandakan surrounded by natural tropical rainforests, or to Nak Hotel where you and your family can enjoy the scenic view at the rooftop restaurant, or at the Sandakan Styles Hotel for some easy access to Sandakan Harbour Mall and town area. 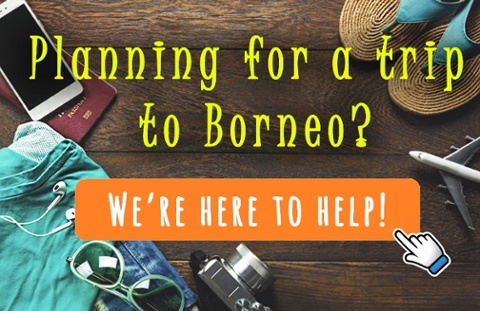 If you are looking for more budget-wise accommodation, you can bring your family to stay at the Borneo Sandakan Backpackers which offers comfort and convenient to travelers coming to Sandakan as well as an easy access to Sandakan town area. St.Michael And All Angels Cathedral. Discover the Sandakan City with your family, where you and your family can get to know some interesting stories behind the historical sites, such as the Agnes Keith House, St Michael and All Angels Cathedral, Puu Jih Shih Buddhist Temple, and Sandakan War Memorial Park. Your Borneo family holidays would not stop there, as Sandakan have much more to offer to travelers who are traveling with families. Bring your family to Sepilok Orangutan Rehabilitation Centre, which shelters about 70 Orangutans that are being rehabilitated before releasing back to the wild. Be sure to go during the feeding time session (10:00 am or 3:00 pm), your kids will love to see the Orangutans up close from the viewing platform. After that, check out the cute Sun Bears at the Bornean Sun Bear Conservation Centre, just a few steps away from Sepilok Orangutan Rehabilitation Centre. The viewing platform is on stilts above the forest floor, get ready with your binoculars and spot the Sun Bears down below. Just nearby Sepilok is the Rainforest Discovery Centre, a good place for you and your family to get close to nature through jungle trails and canopy walk. Apart from that, birding activity can also be done at the Rainforest Discovery Centre, which, up to date, has recorded about 300 Borneo Birds in the area, such as Bornean Bristlehead, Hornbills, Pittas, Leafbirds, Woodpeckers, and more. It is not a surprise that Rainforest Discovery Centre is chose to be the most preferred venue for Borneo Bird Festival that is held annually in the month of September or October. Drop by at the Labuk Bay Proboscis Monkey Sanctuary before your journey to Kinabatangan River. The Labuk Bay Proboscis Monkey Sanctuary offers everyone a chance to have a closer look at the Proboscis Monkeys. However, tell your children not to get too close with these primates for safety precaution, but you are welcome to take a selfie with the primates. At the same time, you can also see other animals such as Silver-Leaf Monkeys and Hornbills scattered around the area. Next, bring your kids to Kinabatangan River for more wildlife adventures and let your family get the experience of staying at a rustic riverside lodge. Proceed on a boat ride for safari cruise along the Kinabatangan River, where you and your family will get to spot some Proboscis Monkeys dangling from the trees, Orangutans resting on the trees, Monitor Lizards by the river banks, and other wildlife. If you are lucky, you can spot a group of Borneo Pygmy Elephants eating or swimming by the riverside. 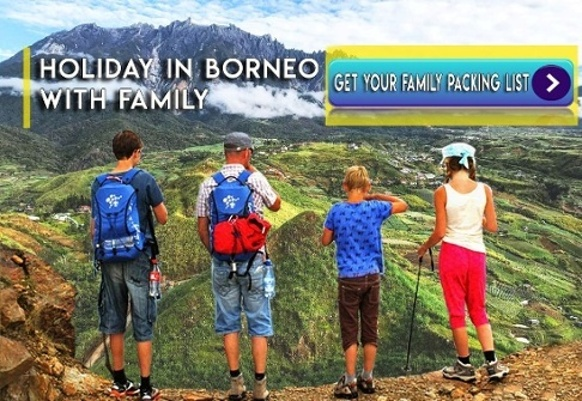 Choosing Sandakan as one of your Borneo Family Holidays destination would be a perfect time to increase the bond with your family and to have a memorable experience together. The best part of it, your kids will have a lot of stories to share with their friends in school. Feel free to read our travel guide to Sandakan to ease your mind on planning your travel in Sandakan. Amazing Photos of Sarawak Borneo that will inspire you to go for Borneo Holidays! Looking for an adventure to scratch off on your travel resolution for 2018? Sarawak Borneo is one of the destinations that you should go for travel this year! It is one of biggest state in Malaysia, and located at the northwest of Borneo Island. Sarawak Borneo is bordered by other Malaysian state, which is Sabah Borneo at the northeast, Kalimantan ( Indonesian portion of Borneo) to the south, and Brunei in the north. Sarawak Borneo plays a major role in being a gateway to Borneo’s natural wonders, bountiful Borneo Wildlife and unique culture. From the city of cats, Kuching; the capital city of Sarawak Borneo, where you can experience the fascinating history of the city, to the pristine rainforests where you can see Orangutans and Proboscis Monkeys on a day trip. To feel more adventurous, you can go on a traditional longboat at the Batang Ai Lake and stay with the Iban communities on a longhouse, where you will encounter a warm welcome and experience more hands on on Sarawak cultures. To fulfill your travel bucket list, go on a spectacular bat cave exploration and hike up to witness the extraordinary rock formations of Mulu Pinnacles at the Mulu National Park. Still not enough? You can also read our other article to know places more to go in Kuching or some of insta-worthy places in Sarawak Borneo. 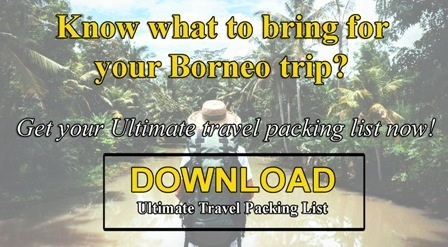 We hope that it will inspire you to book a flight for your Borneo Holidays. Feel free to reach out to us if you want to know more on Sarawak Borneo. Don’t forget, your adventure in Sarawak Borneo awaits you! Sarawak Borneo is the largest state in Malaysia, and it is located in Borneo Island ( the third largest island in the world after Greenland and New Guinea). Sarawak Borneo is known to many for its tropical rainforest and myriad species of Borneo Wildlife, as well as rare plant species. Apart from that, its natural wonders of cave systems and the longest river in Malaysia, Rajang River, can be found within Sarawak Borneo. Moreover, Sarawak Borneo also holds many interesting histories and exotic culture for travelers to experience. From the unique architecture of longhouses to the beautiful British Colonial buildings, Sarawak Borneo is truly an admirable place for travelers to experience the difference for their Borneo Holidays. Good morning world! Nice place to do remote work? An iconic place to explore in Kuching city during the day or night. The red archway indicates the entry point of this Chinatown in Kuching city, known to many locals for being the popular shopping and eating spot. Apart from that, the refurbished of old shophouses are surprisingly nice to look at, as the walls and doors were painted brightly. Most of the shops in Carpenter Street are selling non-touristy stuff, such as bicycle shops, bookstores, hardware stores, antique furniture shops and local coffee shops. Take a stroll along the Carpenter street, and be amazed at garbage-free, amazing mural paintings on the wall and less vehicle moving around the area. Kuching city’s name was believed to have come from the word Kucing in the Malaysian Language, which means cat. There are few cat statues that can be found in Kuching City, where it does not only give a unique feel to the city but can also be a perfect photography subject. This is, after all, Kuching City known as “Cat City”, so, taking photos of the cat statues is obligatory and a thing to do when in Kuching! Natural wonders in Sarawak Borneo will never cease to amaze visitors of its awesome creations, especially the Mulu Pinnacles which located in Gunung Mulu National Park. Centuries of water have eroded and dissolved the rock forming into razor sharp spikes that tower about 45-meter high above the surrounding vegetation. Travelers would need to go through a tough and challenging trail in order to witness the pinnacles. Somehow, looking at the pinnacles will make some believe that they are in one of the scenes in The Lord of The Ring movie! These amazing caves can be found in Mulu National Park, where travelers can witness its uniqueness or sheer beauty. All the caves can be accessible by plank walks and well-lit concrete paths, which offers travelers a chance to see the impressive formations of stalagmites and stalactites, as well as witnessing the spectacular bat exodus at sundown. The serene river, beautiful landscapes and a relaxing walk along the Kuching Waterfront are truly one of the insta-worthy destination in Sarawak Borneo. Most locals and tourist will just go for a stroll along the esplanade or just go for river cruise using the small passenger boat or “Tambang”. During daytime, it offers a scenic view of the historical buildings such as Astana, Fort Margherita and the Malay villages. However, travelers can be expected to witness the beautiful lights coming from the newest icon of Kuching city which is The Golden Bridge, and the lights from Astana at nighttime. Moreover, there is work of arts and sculptures can be seen at the waterfront area, making it perfect for travelers to capture it for their Instagram account! Witness the spectacular view of Miri city from the top of Canada Hill and the “Grand Old Lady” situated on top of Canada Hill. It is to mark the birthplace of the petroleum industry in Malaysia, where the first oil well was drilled by Shell company. Apart from that, travelers could drop by a visit to the Petroleum Museum to learn the history and technological development oil and gas in the country. Damai Beach is Sarawak Borneo most famous and beautiful beach which located on the Santubong, about 35 minutes away from Kuching city. Travelers can just laze around and relax on the white sandy beaches, join the water sports activities, trekking into the Borneo Jungle, birdwatching activities, or experience Borneo culture in Sarawak Cultural Village. Apart from that, travelers should check out the beautiful sunset by the Damai Beach and take a photo of it for their Instagram profile. In Sarawak Borneo, there are some local families in different tribes still practices living in longhouses, because they feel a strong spiritual connection to the rainforest. Mostly they will grow rice, fruits, vegetables, hunting and fishing as their source of income. Nowadays, there are some of the longhouses in Sarawak Borneo becoming tourism destination that will enable travelers to experience living in a longhouse for a chance of a lifetime and learn the Borneo Culture. The surrounding area of longhouses is quite unique and authentic, making the location an insta worthy for anyone who visits longhouses in Sarawak Borneo. After looking at the Instagram photos taken by travelers from around places, ready for a Sarawak tour for this coming 2018? Make your plans now! For further information on Sarawak Borneo, feel free to read our experience a tour in Kuching city and caving adventure in Sarawak Borneo. Deepavali (also known as Diwali) is a Hindu celebration which literally means row ((avali) of clay lamps (deepa) that Indians will light outside of their humble abodes as a symbol of inner light which protects them from spiritual darkness as cited by National Geographic. This glorious celebration is enjoyed by most Indians, doesn’t matter the faith; be it Hindus, Buddhists, Sikhs, and Jains. Even in Malaysia, it is declared a National Holiday (we are, after all, a very multicultural country). Being raised in Sabah and living most of my adult life in Peninsular Malaysia, I had the privilege of experiencing this wonderful celebration amongst other Malaysians who celebrates this auspicious day in colourful sarees and salwar kameez, and decorate their homes in bright lanterns, children running around playing with sparklers and firecrackers, while the elders join together to eat all the delicious Indian desserts they can put their hands on. Most Indians celebrate this auspicious day for various legends pointing to the celebration of Deepavali. One of it is to celebrate Lord Rama’s (together with Ma Sita and Lakshman) long awaited return from being exiled in the forest after a fourteen year exiled from his kingdom and triumph over the demon king Ravana. It is to honor Lord Krishna’s victory over the demonic Narakaasura who kidnapped as well as terrorized the gopis of Vrindavan. It is also to rejoice the day Bhagwan Vishnu tied the knot with Maha Lakshmi. On a whole, Deepavali is to celebrate good against evil, truth over fallacy, light over darkness, prosperity, power to forgive and forget, and the power to progress. The first time I ever stepped foot into a Deepavali Celebration, I was covered head to foot in a 6 metered white and red saree, and accessorized with chunky gold embellishments. I felt like I was overdress, but I was wrong. I was underdressed! All the women were in rich coloured sarees filled with beautiful accessories from head to toe, oh how I was smittened by their looks! And the men, wearing the most handsome outfits fit for a king. Their homes were decorated with the most lavish coloured lanterns, and each nook and cranny you can spot clay lamps with flickering lights shying away each time the wind came to say hello. An old aunt came up to me to ask whether I was married, to which I answered no. She then placed a black Pottu (a dot) just above and in between my eyebrows. I didn’t really understood it at first, but got to know a bit later on that it was to ward off evil spirits or curses and black dot was to show that you’re not married (the world knew I wasn’t married, well, the Indians knew immediately. I got to try out all sorts of food! From mains such as Lamb Biryani and Chicken Masala, to mouthwatering desserts such as Jalebi and Payasam (my personal favourite). I was fed like a King! I wasn’t the only non-indian there, mind you, there were many others who were from different religions as well and I felt very much welcomed even if I did not speak their native tongue. Here in Sabah, there are many Indians as well that has resided and made Sabah their home. We’ve got the beautiful Sri Pashupatinath Temple, very serene and visited by many local Indians for meditation; Sri Subramaniar Hindu Temple, as colourful as Batu Caves Temple; Thirumurugan Temple, as though covered in gold from head to toe; and many others to which has their own devotees. Deepavali or the Festival of Lights is basically celebrated around the globe. It is a celebration of South Asian identities. If ever you have the chance to visit Malaysia, do not forget to join in the celebration of Lights and experience the exceptional wonders of this beautiful culture and tradition.